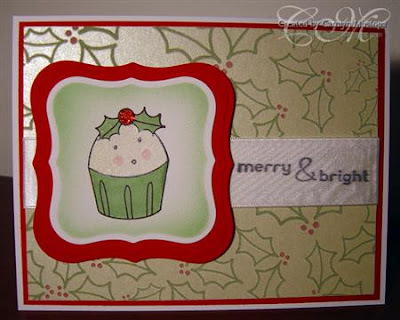 Even though Taylor is off to celebrate an early Christmas with family in Iowa she has still managed to host Cupcake Friday on her blog today with TECC46. Hop on over and play with the Cupcake Crew! Taylor also managed to find a fantastic SASI stamper to be Our Friday Friend this week! Please welcome Carolyn Mustopa (cmustopa on SCS). You can click here to see Carolyn's gallery at SCS and you can hop over to her blog bklynstamper to see her sweet creations. And now let's get to know Carolyn a little better. Since childhood I’ve been involved in some kind of craft, from needlepoint to crocheting to quilting to decoupage to table fountain making — and almost everything in between. But when my sister showed me a Stampin’ Up! catalog from a party she’d attended about 6 years ago, I became instantly obsessed (it’s a Scorpio thing) with rubber stamping. I came home from her house that weekend and called Stampin’ Up! Monday morning to find a demonstrator of my own, and then became a demonstrator myself a week after my party. The rest is history. Hmmm. Anywhere from clean and simple, to simple and elegant. As much as I love to see all of the vintage-y and distressed-looking things my fellow paper crafters create, I’ve never been able to get the knack of doing it myself. What are you favorite projects to create? Cards, cards, and more cards. I have so many cards in my house that I could open a store. I really should send more of them out to people! I also love doing wedding-related things, like invitations, favors, etc. On my blog you can see all of the things I did for my older daughter’s wedding last spring. Honestly, I love all of them, but I only own Season’s Sweetings so far. I just love those sweet-looking cupcakes! It should be no surprise at all: cupcakes! However, my obsession (yup!) with them is relatively recent. Like most mommies, I baked my share when the kids were young, but I didn’t think much about them again until my youngest daughter suggested that we use cupcakes as both centerpieces and favors for my older daughter’s bridal shower. I baked 8 dozen, and one of the bridesmaids baked several dozen more. I thought for sure that when it was all over I’d never want to see another cupcake again, but just the opposite happened! 1 - 8 oz. pkg. cream cheese, softened1 - stick unsalted butter, softened2 - tsp. vanilla extract1 - 1 lb. box confectioners sugar In mixer with paddle attachment, beat first 3 ingredients until very well blended. Gradually add the sugar and beat at medium for a few minutes until it is all smooth and light and fluffy. Yum!!! Thank you Carolyn for being Our Friday Friend! There are lots of opportunities for SASI stampers right now! Today is the last day to get your Top Chef entries e-mailed in to Taylor. You have until Monday to upload to SCS to be entered to win the SASI Holiday Blitz. And of course you could be Our Friday Friend anytime! You get stamping ladies! Thanks so much for featuring me today. What an honor! Congratulations on being Our Friday Friend. :o) Love the cute card. TFS!